Did you know that elephants can be right or left tusked, kind of like humans are with their hands? Did you know that the elephant has the largest brain of any LAND mammal? (The sperm whale has the largest brain of all...) And if you think elephants like peanuts...they really do not! 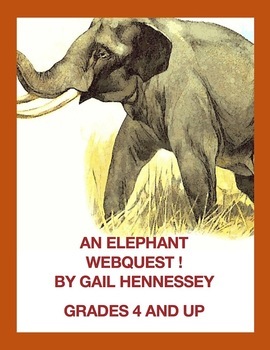 I think your students would have fun learning about the elephant with this web quest! I have included extension activities, additional trivia and the key. Would you like to follow my store? Click by the green star by my photograph.